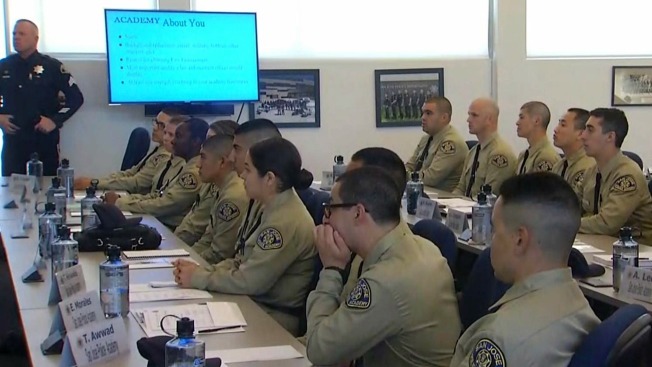 A department staff shortage remains of paramount importance, but San Jose police are brewing with optimism thanks to the number of cadets on hand for the latest academy. Thirty-six recruits are currently knee deep in the second day of training, marking the highest academy total the department has seen in at least three years. "This group definitely gave us a little hope," Heather Randol, a recruiting commander with the department, said. "And it's a result of hard work from our recruiting unit." While confidence is high, the department remains stretched thin, and more officers are needed to serve the Bay Area's largest city. "We need to attract qualified applicants," Randol said. "We need to have academies of 45-plus so we can start rebuilding. Right now, we're just trying to keep up with attrition, and we're not doing a good job at it." The department remains hopeful that it can continue to fill three annual academy classes while competing with neighboring cities that are pulling potential officers away with better pay and benefits. A total of six recruits have departed the current San Jose police academy since it started Tuesday. One left for personal reasons while the others walked away because of pay and benefits standards.